organize 2 days boat cruise with overnight stop in Pakbeng (not included). 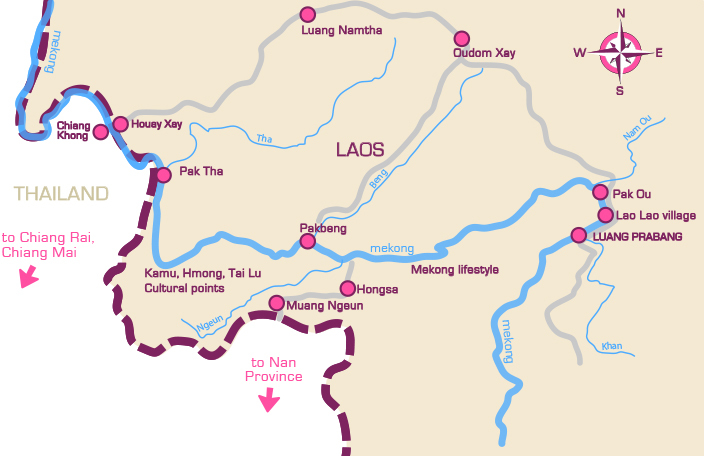 Possibility to cruise from Houay Xay to Luang Prabang or from Luang Prabang to Houay Xay. 07.45 a.m. Pick up from your hotel in Chiang Khong downtown and then transfer to Thai Immigration check point at Chiang Khong border (if you stay in Chiang Khong , meet at the hotel at 7:45 a.m. for transfer to Thai immigration). After passport control stamp , cross the 4th Friendship Bridge by shuttle bus to Houay Xai. (You can grant Lao visa on arrival at Houay Xai) After finish formality process at Lao Immigration, transfer by local taxi or Tuk-Tuk. Boat leave the Houey Xay pier and cruise downstream on one of our boats. On the way, the boat will take its first stop in Pak Tha, to have the voyage documents signed. Lunch is served on board. The second stop will be to visit a Kamu village. The boat will arrive in Pak Beng before the night. Overnight in Pakbeng. 08.00 a.m. The boat leaves Pakbeng. Around 4:00 p.m. End of services. PRICE: This price is including the shuttle bus crossing the 4 th Friendship Bridge. Price with accommodation is base on sharing twin/dbl room. Solo traveler will be single supplementary additional charged. Child is over 12 years old is full normal rate charge. PAKBENG ACCOMODATION: Room include in price will be based on list below, if those place is fully booked. We will provide you similar standard room if available. CLASSIC overnight : DP Guesthouse. Each room contains clean bed sheet, private bathroom with hot/cold shower, fan and A/C. Breakfast included. Price available for a Double/Twin sharing room. COMFORT overnight : MEKONG RIVERSIDE LODGE. Each room contains wooden floor, clean bed sheet, private bathroom with hot/cold shower, fan , private balcony or wide window. Dinner on Day 1 and Breakfast on Day 2 included. Price available for a Double/Twin sharing room. PREMIUM overnight: THE PAKBENG LODGE. Large and well decorated bedrooms. Gorgeous Mekong View from your balcony. Dinner on Day 1 and Breakfast on Day 2 included. From October to February (dry season), it can get cold during the cruise, do not forget to bring a jacket. It is possible to leave luggage and suitcase on the boat and take only small daypack for your overnight in Pakbeng. In case of Force Majeur, the company will not be responsible for the providing services excluded of our terms. Lunch on board as mentioned in the program , drinking bottled water, coffee, tea during meals.